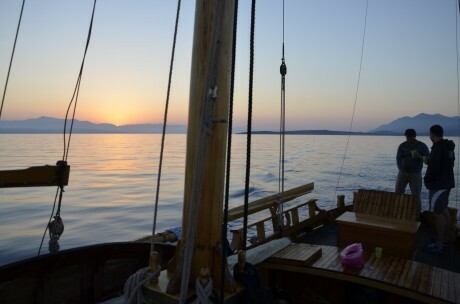 Sailing to Ploče always comes with a bit of relief for me and the crew. 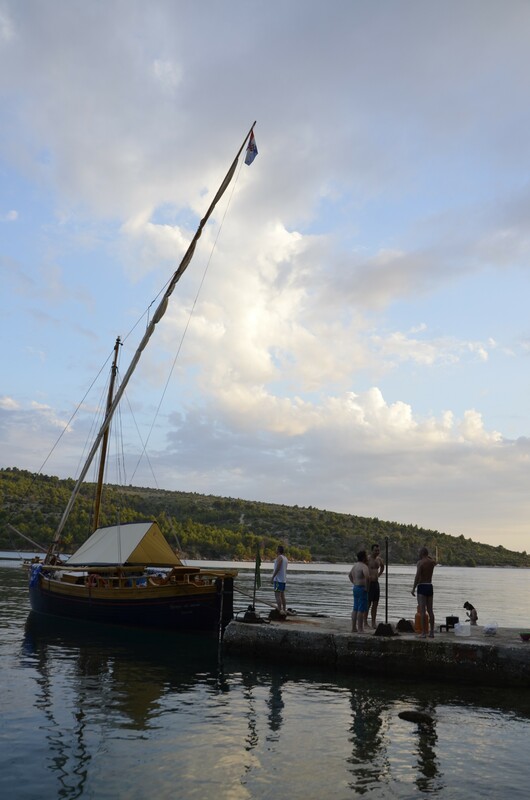 We have planned for a whole year for this trip and some many parts and pieces have to align in order to get the boat and the crew to Ploče to load the watermelons. This year was particularly challenging with the weather. The students had come to the boat a day before to learn the names of lines, How to raise and lower lanteena, and to see where they were going to live for the duration of the voyage. It was then that they saw the clouds forming on the horizon. The rain and wind started that evening. When the students came to the boat the next day, it was clear we were not going to leave. Forecasting weather for sailors has been an important discipline and the students were getting their first course. The flag on the breakwater was screaming in the wind and the menacing clouds threatened rain every few minutes. As a Captain, making the decision when to leave is critical. I wanted the students to have a good time, but also knew that if we didn’t leave soon the distance would be too much to make in two days and we may have to travel at night as we did last year. We needed to travel about 75 miles to Ploče to get our precious cargo. The students were great! The extra time allowed us to get to know one another, play some games, and go to the store to get last minute food stuffs and other forgotten items. Everybody kept asking when are we going to leave. I honestly didn’t know. I was watching the forecast and they said the wind would drop by in the afternoon and we were all watching the flag and it was still straight out smacking in the strong breeze. One part of the curriculum for the Watermelon Voyage that has been fun is letting the students pick the menu. We allow them to be the ones that are responsible for the whole food budget for the trip. They make the choices that the whole crew including captain has to live with. In this case they did pretty well, except they decided to have lots of meat, and we didn’t have a fridge….just a cooler…In the mean time we froze the meat in a friends refrigerator. So we had another variable, when the wind dropped we had to call our friend to bring the food to the boat so we could leave. After one big squall we noticed a change and we decided to call for the frozen pork chops and chicken fingers to be brought to the boat. The crew all joked that the tonight we would have a big bbq then eat canned beans for the rest of the trip. I actually think it was our fault not full explaining that coolers are not cool if there is no ice. By 3pm the wind had dropped and we were ready to cast off. I could see the looks on their faces they were ready, nervous, but ready. We left Kaštela with a south wind and headed for the island Brac. This would be a perfect first night. We headed to the Bay of Bobovisče. I had been here before with students we were sailing the Lateen rigged Leut built in 1885 Slobodna Dalmacija, Dalmatian Freedom. The waves were still pretty big from the storm but we had a nice short crossing to the island and students and crew were happy to have started the trip. For dinner we had pork chops and potatoes. It was great! Sleeping on the boat was interesting. Chris and Orsat had hammocks. The Principal of the home Miljenko and I were in the forward cabin and everyone else sprawled in the hold and on the dock. We were at an old rock mine and the pier was perfect for us, completely empty. Around 2 am it started to rain. I heard the light patter of drops on the deck. I there was some stirring but it seemed as the crew would sleep through it. We had a tent covering the hold and some of the deck. Then it started. BOOM with the thunder and crash of lightning followed by a nice soaking rain. Everyone who had been on the dock scurried onto the boat. We then knew there was space for everyone… 10 people to sleep onboard. In the morning, at first light, we set out. We had a long way to go, about 65 miles. What we had lost in the first day we needed to make up. We had thought about extending the trip a day but it was decided by all to get the Melons as soon as possible. The crew was tired from th e nights rain, and we took shifts at the helm. Most slept while one was at the helm and the other on look out. The wind had shifted and was from the north. 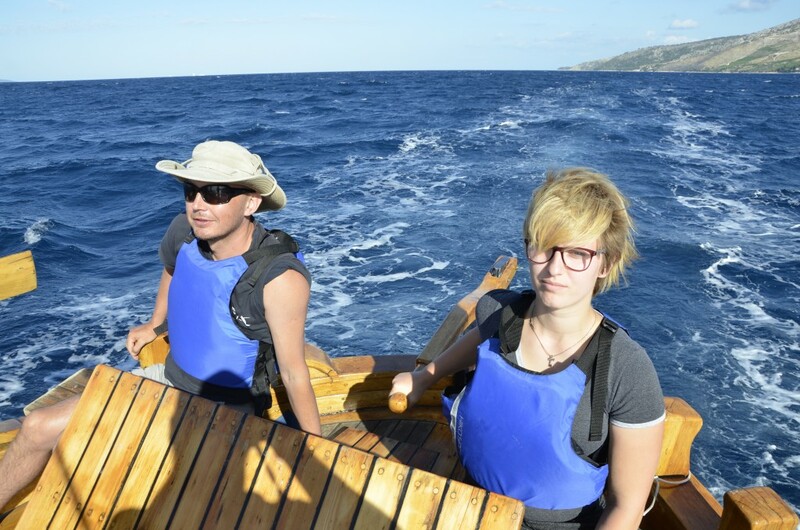 Waves were big but with the fair wind and following sea we made steady progress toward Ploče. At about 3pm we turned the corner of Hvar and stopped for a lunchtime swim. Some of the crew had faired better than others. 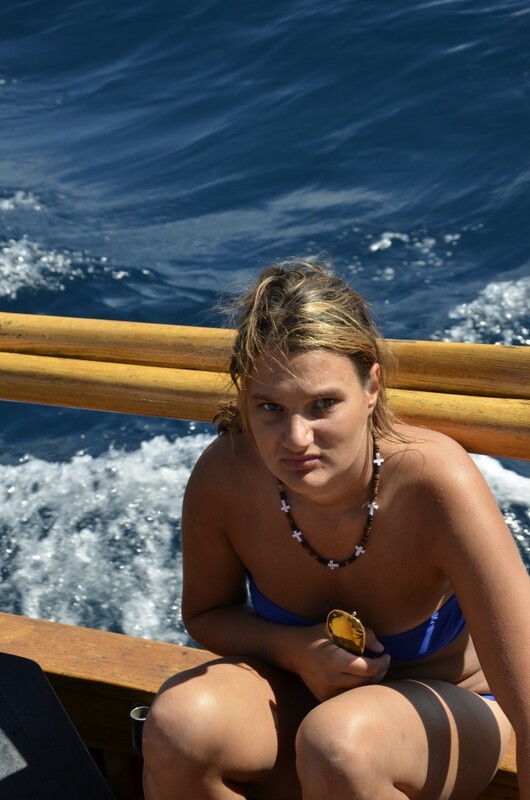 Both Marija and Slavica were sea sick. 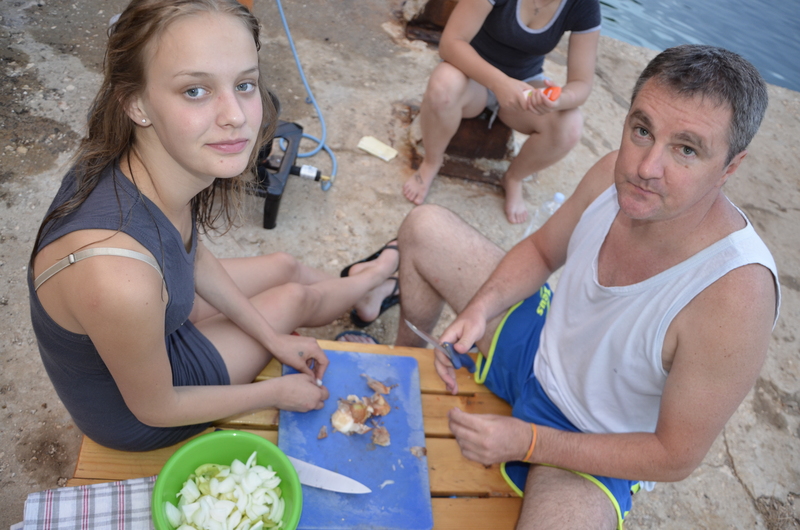 When we stopped for lunch they were feeling a little better but Marija still needed a bit of coercion to go swimming. I think Slavica jumped before we dropped the anchor. We could see Ploče from here, 15 miles and down wind. The beautiful blue water of Suceraj was a perfect respite for us. It had been a long day already and we were in need of a break. With canned sardines, cheese and salad for lunch, the crew started to revive. Smiles started to reappear. The mood on the boat rebounded. Students tried to convince Paval to look at the rudder so they could splash him, but he was too wise for that. After lunch we raised sail and slowly made our way for the arrival in Ploče. This was the first time students had work with the lanteena at 18 meter or almost 60 feet the lanteena required serious attention. Each student got a task and a partner. 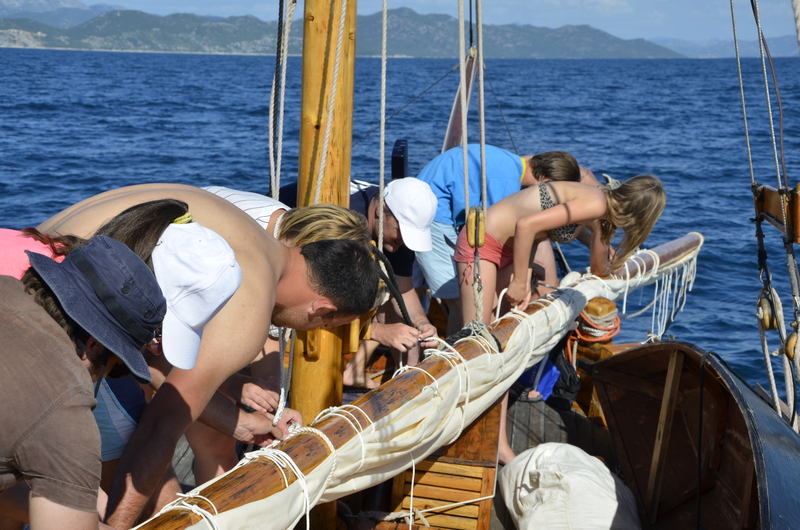 The sail on a latin rigged boat is attached to the spar and needs to be first lowered to the deck, unfurled then set from the bottom of the lanteena. There are eight lines attached to the sail. Each one has a name and a function that needs to be, like a well-choreographed dance, coordinated in a certain order to get the boat to sail. The students learn the names also which were new to the crew. These types of boats are rarely sailed these days. Šusta, Troca, Mont, Orca, Brac, Skota, were all new words for them. We worked together and the long spar climbed the mast with the sail stretched out below. I can only imagine what it was like for Chris our American friend who didn’t know any of the language such as pull or ease or any of the ‘normal’ sailing commands in Croatian. 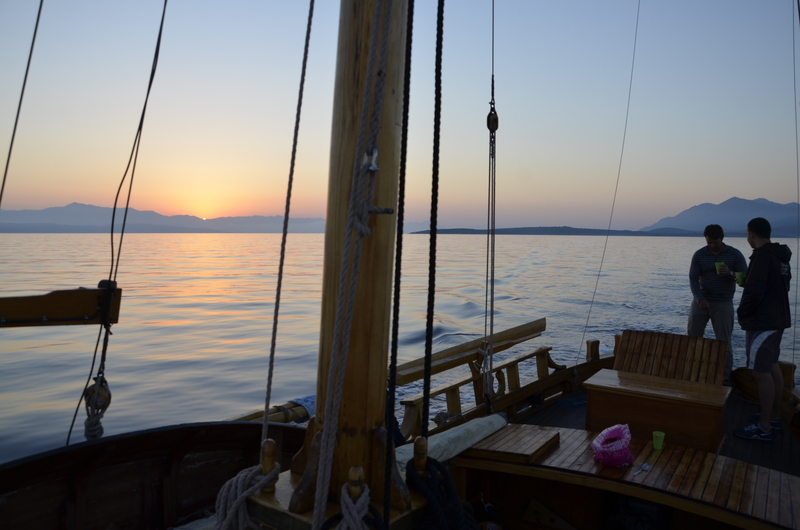 With the mainsail set, we set our course to Ploče and the last few miles fell under the keel. As we came in the harbor entrance again the feeling of relief was felt by all the crew. We had sailed 75 miles and now we were on to the next phase of our trip. Lara the assistant to the Mayor of Ploče met us on the dock and we went to the café to rest our bones and get a taste of terra firma.